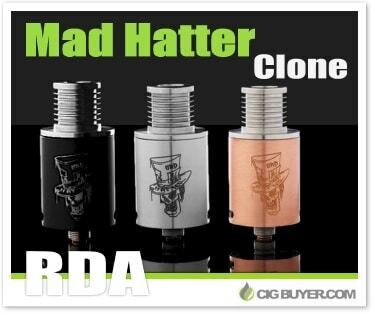 The Mad Hatter RDA is a unique dripping atomizer made by InfeelingUSA. Not only does it have a bold and attractive design, but it has an innovative flip top cap that differentiates it from other RDAs. The cap is attached to a hing so you can re-wet your wick without making mess. It has fully adjustable airflow that enters beneath the coils, three post build deck with large wire holes and copper center post / 510 connection for improved conductivity.